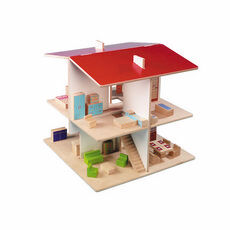 Bid/Buy/Build: The Creative Playthings Slot-Together Dollhouse Is By Roger Limbrick. 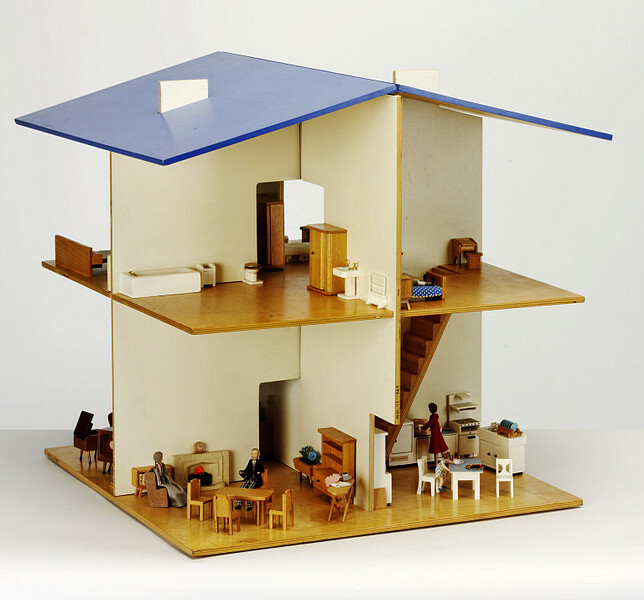 It's funny, all this time it's been an awesome icon of 60s American modernist kids design, and I'd never actually wondered who made the Creative Playthings slot-together, openside doll house. 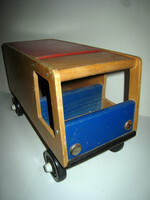 The answer, which Andy knew all along: British designer Roger Limbrick, for the British educational toy company Galt. Where Creative Playthings sourced it in the mid-60s. There it is in the collection of the Victoria & Albert Museum, full of ticky tacky furniture. Amazingly, Galt still manufactures the open sides doll house today. Alas, it's made out of MDF. And it's £59.95 new, plus shipping. Which is not that much less than the fine-looking vintage example shown up top, a 1969 model that is currently on eBay for an opening bid of $100 [plus $40 shipping? Really?]. Which all makes DT reader Lauren's recent email suggestion all the more compelling: why not make one? If anyone is up for taking decent, straight-on photos of the pieces in your disassembled Creative Playthings dollhouse, I'd love to publish plans for making it. With a simple, gridded PDF, you could make a house out of the original 1/4-in. ply, or maybe out of gatorboard, or foamcore. You could make one out of plexi or aluminum for that matter. How sick would that be? You could also change the scale, turning the floor-filling original into a travel-sized, Playmobil hideout. And of course, you could paint it any way you like. Maybe we get the plans together, and then have a contest. With prizes, or maybe a benefit auction, with artists and designers making their own interpretations. Anyway, phone lines are open for your suggestions. I love this idea so very, very much. I did this with a pricey slot together play kitchen. If someone has even a couple different views of the thing I can reverse engineer it and put up drawings and tool path files. Are slot-together houses easy to DIY? 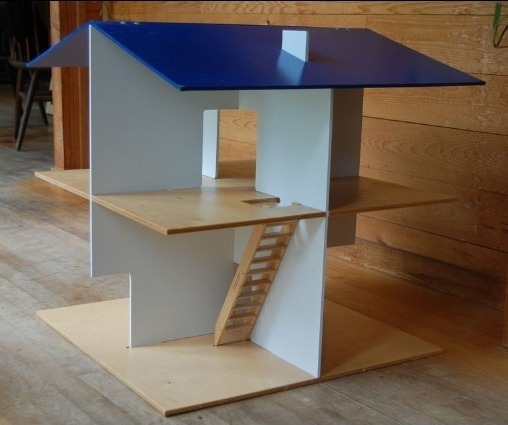 Looking forward to seeing those photos of dismantled dollhouse, just to get an idea if it is doable. I have one and will take some measurments on it. I did make a few for friends using the original as a router pattern. It is a cool playhouse. If you could post photos of the parts disassembled too, that might be enough for me to draw it up with a couple of dimensions like thickness etc. Could you give me an idea of approximately how much it cost you to make one? 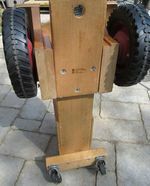 I am by no means able to do any carpentry work beyond sanding, but was thinking about birch plywood. There's a woodworking store here that will do the tough stuff for me.....just don't know what to expect. Hey Greg did you by chance ever get to this? I would lI've to make tis for my two little girls for Xmas this year. Thanks! I actually own this dollhouse - it was mine as a kid, complete with a lot of the furniture! I have the walls, roof, and bracket, even the ladder, but no floors. And I also have the assembly instructions. I'd be happy to post photos and scan the instructions if someone can then tell me how to make the floors. How do I upload photos here? Or should I send them directly to you, Greg? Found images of it disassembled!